China will never adopt Western-style democracy with a multi-party system, its top legislator has said. Parliament chief Wu Bangguo said that China would draw on the achievements of all cultures but would not "simply copy" the West. Communist Party leadership should be strengthened and "the correct political orientation" maintained, he said. Mr Wu made the comments in a speech to the National People's Congress, China's annual parliament session. 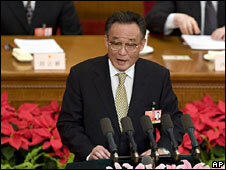 He ranks second only to President Hu Jintao in the Communist Party hierarchy. "We must draw on the achievements of all cultures," he told delegates in Beijing's Great Hall of the People. "But we will never simply copy the system of Western countries or introduce a system of multiple parties holding office in rotation," he added. "Although China's state organs have different responsibilities, they all adhere to the line, principles and policies of the Party." Correspondents say Mr Wu's statement appeared to be a deliberate rejection of calls in China and abroad for greater liberalisation. China faces a number of highly sensitive anniversaries this year, including 20 years since the military crushed pro-democracy protests in Tiananmen Square, and 50 years since an anti-China uprising in Lhasa that sparked the Dalai Lama's flight into exile. The authorities in Beijing also fear that the economic downturn and job losses for millions of migrant workers could trigger outbreaks of social unrest.